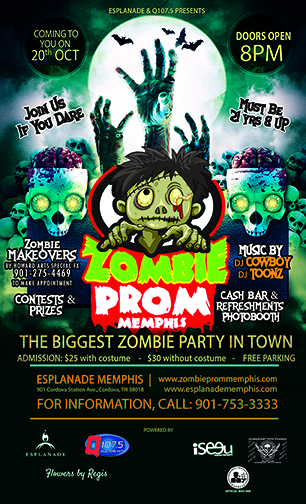 HowardArt SPFX will have artists onsite to help you with your Zombie Makeovers. Call Today to schedule your appointment 901-275-4469. Special effects start at $10 and go up from there! We're excited to crown a Zombie Prom King & Queen, Best Dressed, Best Costume and we'll have some exciting things to participate in...so stay tuned! Advance Admission tickets will be $25 and $30 for ages 21 yrs & up. Go to EventBrite.com for tickets or stop by the Esplanade. Join Us If You DARE on October 20, 2018 for the biggest zombie party in the city for ages 21 yrs and up! Tickets: $25 with costume, $30 without costume. Early Bird Tickets $20 thru Friday, October 12th. Onsite Zombie Makeovers will be provided by HowardArt Special FX. To schedule your makeover in advance call 901-275-4469. Music by DJ Cowboy & DJ Toonz to keep the party moving. Special appearances by Q107.5 radio personalities, Nugget & Joe Mack. Cash Bar, Light Refreshments & Photobooth. Purchase your tickets today, get your costume and schedule your makeover. We're going to have a ground-raising good time!